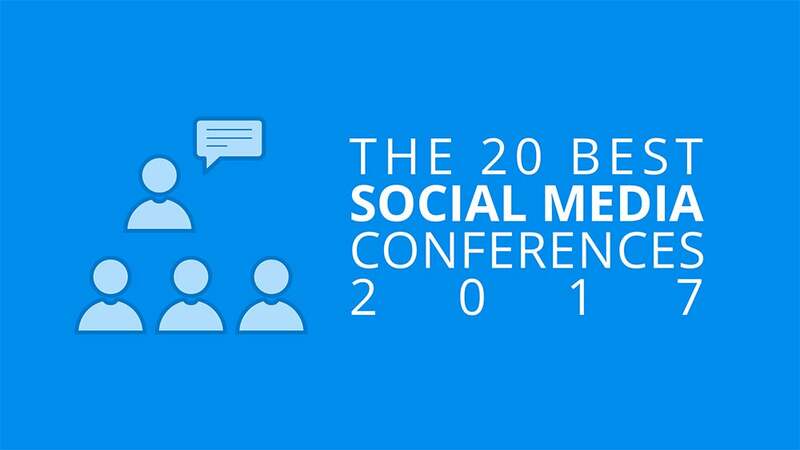 Here's a list of the top social media marketing conferences for this year. Working on social media can be a little lonely at times, especially if you are working as a team of one. Imagine being around like-minded people who understand your daily struggles and learning from top professionals in the marketing world. Maybe even doing this while on a vacation! Social media conferences are the secret to all that. These conferences, ranging from one day to a week, promise talks from top social media experts, workshops on the latest social media strategies, networking opportunities with fellow marketers and more. Pro-tip: If you are traveling to any of these conferences, you could also turn it into a mini-vacation. Here’s a list of 18 top social media marketing conferences for 2017, with all the information you need to know such as date, location and price. Here’s a quick overview of the top social media marketing conferences for the rest of 2017. This list is arranged chronologically. To see more details, click on the respective links. With the mind-blowing amount of content being created daily, Content Marketing Conference wants to give you actionable tips and strategies to create great, engaging content. The talks will cover everything from planning, to creation, to optimization, to distribution and more. Social Media Strategies Summit has been running for seven years now. Apart from the conference in Chicago (SMSS Central), there will also be Social Media Strategies Summits in New York (SMSS East, October 17-19), Boston (Higher Education, November 2-3) and San Francisco (SMSS West, February 2018). This summit covers more than how to use social media but also how to measure and analyze your social media data to perform better. Besides this summit, the organizer, Innovation Enterprise, hosts more than a hundred webinars and summits on various topics each year. Social Media Camp is Canada’s largest social media conference, and this year’s conference is its eighth annual event. On top of marketing discussions, there will be sessions on ethics, work-life balance and security on social media. To help you make the most of the conference, there are SMCamp coaches (social media professionals in various industries), who would tell you which are the best sessions to attend according to your goals and help answer any questions you have after any sessions during the conference. Engage Prague is organized by the team at Socialbakers, who provides social media marketing and analytics tools. The first two days will be filled with more than 40 hands-on workshops, and the final day will be a conference. There will also be Engage Bali, Engage Americas and smaller events coming up next. This three-day social media conference is organized by PR News and Social Media Today. Speakers from companies such as Twitter, Google and The Coca-Cola Company will teach you about social media marketing, content strategies and PR. One thing in the agenda that stood out for me is the case studies sessions where real-life examples will be discussed. We found that 83 percent of marketers want to create more video content if they aren't restricted by time or resources. WistiaFest might just be the conference you need to help you improve your marketing efforts through videos. Social Media Week organizes conferences in 12 cities around the world throughout the year. While the next conferences are in Los Angeles, Mexico City and Milan, there will also be conferences in Jakarta, London, Rotterdam and more for the rest of the year. There are also independently organised Social Media Week events in more than 10 other cities. If you work in a big company, Corporate Social Media Summit might be the best one for you. You’ll get to hear from leaders of top brands such as Unilever, Adidas, Lego and more. There’ll also be a chance to be paired with one of the speakers, who would discuss and work through your social media strategies through breakout sessions. While #DMWF Expo Global covers a range of topics from content marketing to AI and VR in digital marketing, it has a track solely for social media and influencer marketing. Besides this expo, there will also be #DMWF Expo Europe (3-4 April, Amsterdam) and #DMWF Expo North America (dates TBA, New York). VidCon is all about online videos, from social media videos to YouTube videos, to even virtual reality videos. While it doesn’t focus purely on the marketing aspect of videos, I believe there’s a lot to learn about creating great videos and engaging your community. VidCon is also happening in Europe (April 7-9, Amsterdam) and Australia (September 9-10, Melbourne). The largest content event, Content Marketing World, is expecting more than 4,000 attendees and 225 speakers this year. With an amazing speaker lineup of content marketing leaders, it promises to give you all the information you need to create and execute a content marketing plan. INBOUND, organized by HubSpot, is probably the most well-known inbound marketing conference around. INBOUND 2016 featured a diverse group of speakers like Gary Vaynerchuck, Anna Kendrick and Serena Williams and had almost 300 breakout sessions with top sales and marketing experts. Spredfast was able to get incredible speakers for the previous summit, and I believe, will continue to do so this year. There were keynote speakers such as Cubby Graham, social media strategist of charity : water and also speakers from Airbnb, Twitter, ESPN and more. If you want to see whether you might like the summit, you can catch up on the recaps of the summit here. If you are a fan of social media tools, Social Tools Summit is made for you! It is a conference dedicated to social media tools, focusing on the tools that are available and how to use them to maximize the ROI of your social media efforts. There is also a LinkedIn Group for conference attendees and anyone interested in discussing social media tools and best practices. PubCon was listed as one of the must-attend conferences for entrepreneurs in a Forbes article in 2013. While it is a social media and SEO conference, it covers a wide range of other marketing topics such as SEM, content, email and more. Social Fresh is a social media marketing education company which creates articles, podcasts, research and courses. It has also organized 18 Social Fresh Conferences so far! I believe Social Fresh will host another conference this year, and it’ll be a great one to look out for. A great thing about social media is being able to engage and connect with your customers and community. CMX Summit is one of the top conferences for community builders. If you are curious about the types of talks at CMX Summit, the CMX Hub team is awesome enough to share all the talks from their past events on their website.